After spending a couple vacations last year, with friends and relatives in New Mexico, I've been wanting to write down a few of the ideas and recipes I've come away with. The food there is amazing; colorful, flavorful, creative and full of ingredients or combinations I'd never tried. I fell absolutely in love with (among other things) the green chiles that New Mexico is so famous for. There are as many definitions for "chile"as there are people in New Mexico, but most simply it's either "red or green". Either its the famous green New Mexico-grown chile peppers (especially the Hatch chiles, grown in southern New Mexico) that are roasted over a fire until their skins blacken and char. The skins get peeled off and the soft chiles are chopped and cooked in whatever recipe. Its counterpart, the red chile, which is the same pepper, but picked later in the season so it is red (ripe) and then dried, ground into powder and blended with liquid to make a red sauce. You also see the dried red pods made into beautiful chile ristras (strings or wreaths of chiles) for sale all over Santa Fe and Albuquerque's Old Town. (Well, everywhere actually, I just happened to see them a lot in the "tourist-y" places because that's where I went mostly, this trip). Spanish settlers brought the chile pepper into what is now New Mexico in the 1600s, and it is now the state's largest agricultural crop; it's consumed at every meal, celebrated in songs and at festivals, and is the subject of the Official New Mexico State Question, "Red or green". The question refers to the color of chile you want on your food and you'll get asked at every Mexican (or New Mexican, sorry!!) restaurant. I think the reason the rest of us know so little about New Mexico's green chiles is because they don't transport so well. They're a fresh and seasonal vegetable, (well, yes, technically a fruit) and the only way to really appreciate them is freshly fire- roasted, though the fire-roasted and frozen variety are pretty close if that's your second choice. Canned slimy green chiles are not even an option. OK then. 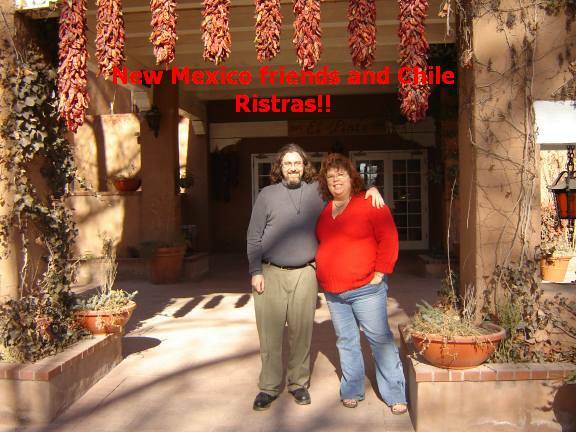 So this past Christmas break, I spent some time in New Mexico, and returned with my tummy full of green chile and my brain full of recipes, ideas and happy memories. OK, so, first of all, one of my new favorites, Green Chile Stew. This stuff is addictive, it doesn't have to be SUPER spicy but I tend to like it that way. With all those Vitimin-C-filled chile peppers, it's great for a cold and (I discovered), it's sorta like meatloaf or apple pie, there are hundreds of slightly different versions of the "official" recipe! Normally it has pork or something dead and disgusting in it, but here's the vegan version that I learned from one of my wonderful veggie freinds. Place the Crumbles or Meal Starter strips in a skillet and brown a bit in the oil, remove and place it in a kettle or stock pot. Put the onions in the skillet, adding more oil if necessary, and sauté until they are browned. Add the garlic and cook for an additional couple of minutes. Remove them from the skillet and add to the 'meat'. Pour a little of the water into the skillet, bring to a boil, and deglaze. Pour the liquid over the 'meat'. Add all the remaining ingredients, and simmer for an hour or so, 'till the potato is soft. Another new favorite for me is Posole. (Also spelled 'Pozole'). Posole is a New Mexican soup traditionally served on Christmas Eve. 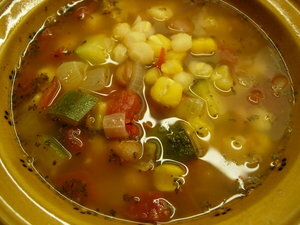 It is made with a type of corn, hominy really, that's been treated with lime (I know, sounds weird). You buy it dry, soak it forever, and when the kernals start to burst, it's time to cook the rest of the soup. 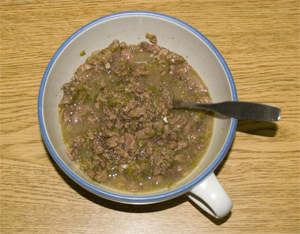 Posole is also 'traditionally' made with pigs feet. Obviously I left those out (UGH!). I love creating my own traditions with veganized versions of regional and cultural favorites and this is a great example, though in all honesty, I got the recipe - or general idea - from a friend who's lived in NM basically all his life. My 6-year-old goes NUTS over this stuff, she'll eat three bowlfulls in a row, with really HOT green chile sauce (though I think it's 'traditionally' served with red, once again, there we go, breaking tradition). I have to buy the dried posole corn or hominy (or cacahuazintle is technically what it says on the package) in New Mexico, or at a tiny little specialty market in Seattle, or bribe a friend to mail some to me, so we don't make this as often as my kids would like. Canned hominy is JUST not the same. I tried it, it was AWFUL! Soak posole/hominy corn in a large amount of water overnight (it will swell quite a bit!!). The next morning, cook posole in water in crockpot on low for about another 12 hours until the kernels have softened and begin to burst. Drain the posole and rinse well. Heat the oil in a 6-quart pot and sauté the onions until golden. Add the garlic and sauté for 1 minute. Add the posole, dried chiles, broth, cumin and oregano. Bring to a boil. Reduce the heat and simmer for 30 minutes. Add the salt, to taste, and continue cooking for 30 minutes. Stir in the cilantro. Taste and adjust seasonings. Serve with warm red chile sauce on the side. Yum! **In the picture I took above, I had added some red and green bell peppers for a little extra interest though they're not necessary.